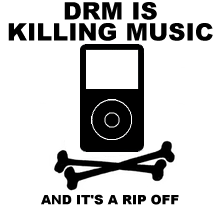 By now almost everyone knows that Steve Jobs, Apple's CEO, wrote two days ago an article about DRM on iTunes Music Store, in reaction to the the latest events in Europe, where several countries are telling Apple to ditch DRM or else they're going to be sued. Using his words, Apple would embrace DRM-free music "in a heartbeat" if "the big four music companies would license Apple their music without the requirement that it be protected with a DRM. ", or so they say. "Much of the concern over DRM systems has arisen in European countries. Perhaps those unhappy with the current situation should redirect their energies towards persuading the music companies to sell their music DRM-free. For Europeans, two and a half of the big four music companies are located right in their backyard. The largest, Universal, is 100% owned by Vivendi, a French company. EMI is a British company, and Sony BMG is 50% owned by Bertelsmann, a German company. Convincing them to license their music to Apple and others DRM-free will create a truly interoperable music marketplace. Apple will embrace this wholeheartedly." In other words, they're trying to escape from the lawsuits that are comming, by telling Europe to force the big four to do a nice deal with Apple... instead of forcing Apple to do their job. "Our concern is of course that it's Apple and [the] iTunes Music Store [that] should be addressing the issue of record companies and DRM themselves if it needs to be addressed - and as we've stated earlier it's iTunes Music Store that's providing a service to the consumers and therefore has the responsibility to offer up a consumer friendly product." "no matter what agreements [the] iTunes Music Store [has] entered into, they're still the company that's selling music to the consumers and are responsible for offering the consumer a fair deal according to Norwegian law." "We have no doubt that a technology company as sophisticated and smart as Apple could work with the music community to make that happen"
"The feedback from fans (has) been very enthusiastic,"
"I think the labels will release selected back-catalog stuff, to see what happens"